In my travels around the internet today, I came across O'verlays fretwork panels. They're made from PVC and are paintable, lightweight panels that add decoration to your furniture. Designs include Greek keys, quatrefoils, figure-eights, and other geometric shapes. They're especially great for adding ornamentation to plain IKEA furniture— you can choose kits specifically for the model you own. For inspiration, visit the Facebook page or the project gallery, and learn about painting options here. 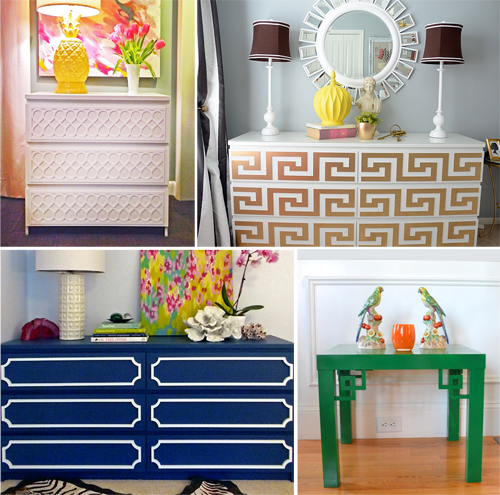 An interesting resource for DIY furniture makeovers. Have you been fretting about your furniture? I just love the fact that for every good idea (IKEA's - good design for the masses) there's an even better one (let's make IKEA's furniture unique!). What I don't love is that some websites (and your blog) reach the world outside the US (Hello there!) but there is nothing on their website to say where they ship to. I have to say that the idea is great. The prices, however are insane. I'm certainly not going to spend $10 on a Lack side table and then add $60+ (just for the corner keys, the strips would make it closer to $100) worth of PVC plus paint, adhesive and labor. At that point, I might as well have spent the money to buy a nice piece of vintage furniture in the first place. Oh my oranges! I am in love with your website! And I love your graphic designs even more! It would be so awesome if you'd make a book-themed design. Thanks for sharing, what a great idea! Hm, kind of a really great idea--some of the prices aren't too exorbitant, either (unlike Bemz... *tears*). Although, I agree with Alana that up to a certain point, it makes more sense to just shop from a flea market or vintage shop for all the work and money involved. I think it's extremely DIY-able, though (again, work + time), but if you find a good secondhand piece or if you just want to update some current furniture, it may make sense to DIY it.